Monty makes plans for a bumper harvest of fruit when he adds raspberries to his fruit garden. Carol tavels to Bodnant Garden to celebrate the delights of the late winter border. get on with our spring jobs, and this is one of my favourites. It's pruning back the pleached limes. a cube, but I've also got them lining the cottage garden. and also keep really good colour next winter. and the Rubra refers to these lovely red bark on the stems. That gives good, strong winter colour. across summer, and next winter those shoots will be really decorative. because not only am I cutting back, but I am also planting. I've got a tree to plant, which is always a big moment in any garden. a welcome splash of colour to what can be a monochromatic March. to celebrate some extraordinary seasonal planting. and these poor old grass borders were just smashed flat. they are best thing in the garden, not this year. growth, ready for the new growth to come through. a little bit too warm. is just to remove the growth that is loose. and sometimes you can damage them. and small mammals and insects. It is really good winter cover. but go steady as you go, because you'll never know what you'll find. Can you see how the new grass is beginning to appear? I'll cut that, I won't pull. because it grows from the base. and we want to keep nice form as it grows up. but that's starting to see next year's shoots. And it is really dramatic and tall. It's good for small gardens if you want drama in a limited space. because these are almost like bamboos, they're so thick. This is actually a good example, now I've cleared it. You can see how the plant is spreading out. and the middle is empty. That's how it spreads. It spreads out as a ring. and that will invigorate it, but not now. This is not the time to do it. really run a high risk of dying. and then that is the time to move it. You only should cut back deciduous grasses. difficult thing, but some, really good ones, are evergreen. And this is a pheasant grass. and the way to deal with these is completely different. pulling out any dead material that wants to come. And the living green will stay put. You just comb them out. It's a bit like brushing Nigel. and all of us crave colour in spring. you can have spring colour, and Joe shows us how. and as gardeners we are desperate for spring to...well, spring. the garden is dominated by bare soil and twigs. We have this lovely evergreen skimmia. It's in flower and it'll have lovely berries in the autumn, as well. in here, which I think the other plants will be absolutely fine with. nice, glossy foliage, and this is a really good shape. or is it just going to be seen from one side? and the other plants will fill in in front of it. That's going to sit at the back. and make sure you have got the good face. This is a combination of gardening and flower arranging, really. and that will pick up nicely on the purple stems of the skimmia here. because it's also got a small pot. Just slightly at a rakish angle. the edges of the pot, so I went for this lovely, lime-green carex. It has some flowers on it just coming through at the moment. and just added a little bit of detail. It gives it nice definition. You can get them in all sorts of colours. Really garish colours, if that's your sort of thing, then go for it. and then this butter-yellow one. where you think they will look good. They sort of add that mid-level to the planting. and adds another layer of interest to the design. Well, I'm pretty pleased. I think the combination of plants go together nicely. There is good texture and there's plenty of colour still to come. we need at this time of year. gone for an evergreen shrub as a fulcrum to the design. This is a Drimys lanceolata, which is a mountain pepper. scented flower, a bit later in spring. I've got a grass, which is nice and feathery on one side. and with a dusting of snow, yes, doesn't it look pretty? you saw it right here. Right, you're coming with me. but in spring, there is one tip that always works. Get all your pots and put them into one place. to get lost in the brownness of March. because we did have a tree here. but then it got a bleeding canker. That resulted in it splitting, it became dangerous, so we cut it down. In fact, the stump is over there. because I still need that focal point. The tree I'm going to plant this time is a hornbeam. which they always used to be. and bare root trees are those that don't come in a pot. this was in a field until a couple of days ago. and you tend to have a much wider choice to choose from. The critical thing is not to let them dry out. I don't know if you can see these little fibrous roots here. These are the feeding roots. The big ones like this don't matter so much at all. If you let these dry out they can die. Actually, that is pretty much perfect height. You notice, I haven't added any compost at the bottom of the hole. I don't want the roots to stay in this hole. I want them to grow out of it into the soil. to be slightly higher than the surface. drown than they are to suffer from drought. which just gives it a start. and the tree has much better access to the nutrients in the soil. There are two reasons really why I've chosen this hornbeam. it will relate to the hornbeam hedges and that will work well. Two, because it is a fastigiate type. but I didn't know the source of the word. Actually, it comes from the description of "like a gable". A tree that grows to a point, like the gable end of a house. although generally it just means an upright growing tree. but they are really good for a small garden. that doesn't take up too much space. A tree this size needs supporting for about three years. as it will establish secure roots more quickly. making sure that the stake and the tree can't rub. give it a really good soak and then it's time to mulch. The mulch is really important. This is garden compost, which is ideal. and grass and to keep the moisture in. until the leaves start to appear and then it really will look good. that looks good all the year round. they have just got to put up with a dismal, gloomy garden. which are very appropriate in a much smaller space. Take this very simple combination of two plants. For a start, there's these big uprights of the Pinus mugo. The clue is in its name. and it's rising up from this carpet of white heather. This is Erica carnea Springwood White. and nectar to any visiting insects. and very, very easy to maintain. Here, the combination is all about structure and texture. and here springing out are these acers. It is Acer conspicuum Phoenix. and at my feet the most glorious repetition of colour. and something you could take any part of and do yourself. but also there are plants that we are all used to seeing. Take this one, you Euonymus fortunei Silver Queen. which proves it's a really straightforward plant to grow. just springing out through the top of it. It brings the whole thing to life. And there are all manner of these different coloured cornus. a Midwinter Fire that is pale and orange. And in every case, you can find great plants to associate them with. Scent is one of THE most alluring qualities of the Winter Garden. things, including some beautiful stand-alone specimens. Like this beautiful Arbutus andrachnoides. rubbed by countless hands, so it has developed this fine polish. are all sorts of painterly touches. you could ever meet in the middle of winter. Bodnant is an inspirational garden. It's packed with creative ideas and exciting plant combinations. now is the time to plan for next winter. All you need is a few simple ideas. and perhaps some early spring bulbs. and a fitting prelude for the season to come. One of the measures of a garden is how good it looks in winter. And Bodnant certainly looks good. and it is high time I made a return visit. but having seen that, any time of year is going to be good. And these crocus have done me really well this winter. and I'll certainly be planting more of them for next winter. and the best way to contact us is via our Facebook page. we could help with, we may well come out and see you. cordon apples, pears and gooseberries. so I've had to wait almost 12 months to complete the planting. that should be at the top of everyone's list. and a cool, mild winter. and they certainly don't like sitting in cold, wet soil. So I've added some compost. This will lighten it up, as well as feed it. It is important to make sure you have got good drainage. probably worth investing in a bit of grit, which will lighten it up. These are long-lived plants. They will live for at least ten years. Now, what I've got here is some bare root. They are all the same variety, it's Glen Ample. And it will produce its fruit from the middle of June to early August. go for something with pencil-thick canes already. will carry next year's fruit. I can space these out. Which is about 60 centimetres in new money. I don't want to put them in the ground too deep. that wants to be just about at soil level. The roots are fairly shallow. The woody root is not really important. a mat as the plant grows. you can't fork, but what you can do is mulch them really thickly. and cool, which is what they like. and this will stop them rocking in the wind and damaging the roots. Then give them a good soak. important, is to mulch them and don't just use any old mulch. and that's what raspberries like. and they'll be all the better for it. mushroom compost on raspberries, because it's alkaline. otherwise you have to wait until next February or March. because you can do them this weekend. but the soil will remain cold for a while yet. right down to the bottom bud if you choose. must get on with now to give the plants a chance to develop. and putting two seeds per tube. before planting them out round about the beginning of May. This is the last of this lovely witch hazel. and the yellow has all the freshness that is so good about spring. That's the last of today's programme, too. That's it. is still open until midnight next Thursday. and how to enter from our website. just that little bit further on, next Friday at the same time. It is the prime time for bare-root plants and Monty makes plans for a bumper harvest of fruit when he adds raspberries to his fruit garden and gives advice on how to plant bare-root trees. He also gives tips on what we should be doing now to get our gardens ready for spring. 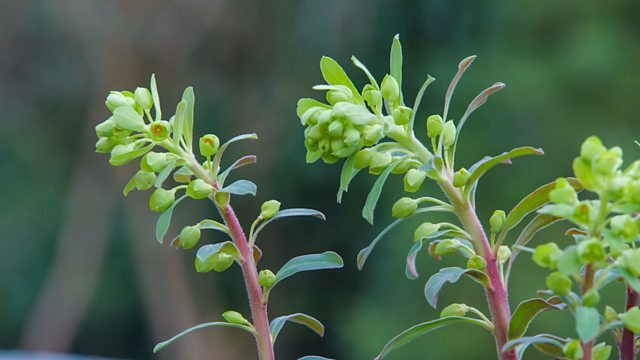 Carol Klein travels to Bodnant Garden in Conwy to celebrate the delights of the late winter border. If you are yearning for warmer weather and your garden currently lacks interest, Joe Swift has designs on brightening up dull and uninteresting spaces with pots full of colour that can be planted now.